Spinnerbaits are extremely popular and effective fishing lures for a wide variety of species, their design mimics a small school of fish swimming together. The bottom section with the fish head and silicone strands attached moves through the water, giving the impression that this is a larger fish swimming with smaller fish in a school. This lower section also contains a large single hook, and due to the design can handle fishing between weeds much easier than other styles of lure. 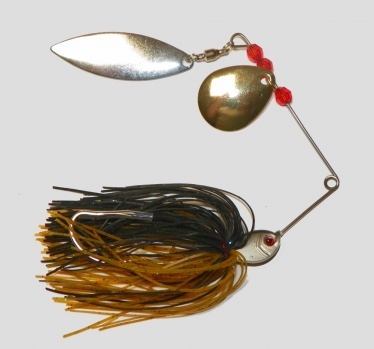 A small change in fishing style is required when changing from regular spin lures to spinnerbait lures, mainly due to their size being much larger and the design of the two top spinners, fish may initially target and strike the two spinners at the top, before realising they aren't able to get a hold and then attack the lower imitation bait fish. Due to this, allowing the fish a small adjustment time is often best before trying to set the hook. Fishing line attaches to the central hoop between the lower lure and top spinners. This 14 gram spinnerbait will suit most fishing rods, including cheaper variants.